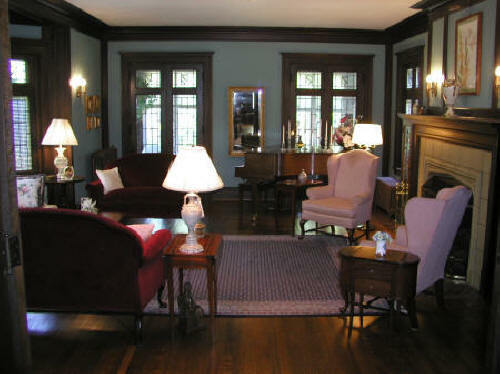 The English Manor Bed and Breakfast is a beautiful 1920’s Tudor mansion located on a tree-lined street in the heart of quiet Miamisburg, Ohio. You’ll love the relaxed elegance of this stately home, which is graced with red oak polished floors, leaded and stained glass windows and Rookwood fireplaces. Every room is appointed with antiques and period furnishings, and a sweeping staircase leads up to spacious bedrooms and baths. You can curl up by a fire in the living room with a glass of wine, “tickle the ivories” on the baby grand piano, or just relax in your comfortable bedroom. Miamisburg, a sleepy town founded in 1818, is just nine miles south of Dayton and minutes from shopping, fine restaurants, a scenic bike trail, golf, baseball, antiques, museums and much more. English Manor was created in 1924 by William Schieble, a wealthy toy manufacturer who helped build the town of Miamisburg. William’s father Benjamin and his mother Rebecca operated the Schieble Hotel in Dayton before moving to Miamisburg in 1881. Once here, Benjamin managed the Miami Hotel and later owned a grocery store. Son William was one of 11 Schieble children and went to work for a toy manufacturer in Dayton in 1904. He started the Schieble Toy & Novelty Company in Dayton and manufactured all kinds of friction toys. His booming business employed 100 people. 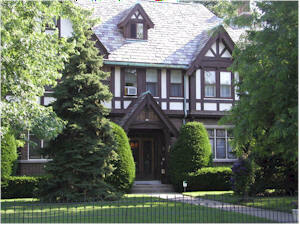 He built English Manor (known simply then as the Schieble House) in the Tudor style and joined “millionaire’s row” of mansion-type homes on Linden Avenue. He and his wife had three children, and based on family photographs, we know his grandchildren also enjoyed the rambling house. Two other prominent Miamisburg families lived in the house before it was converted to a Bed and Breakfast in 1992. Larry has enjoyed being in the wine distributing business for the last 30 years. And like the Schieble family his father also owned grocery stores, while his mother ran a catering business.